It is usually left off of world maps, but in this one Antarctica is the guest of honor. Most flat map projections, even if they do include Antarctica portray it as a wide band of white, with little visualization of how it actually appears. Above is a map viewing the spherical Earth from a southerly position, providing the least distortion to Antarctica, but giving a very different view of where South America, South Africa, New Zealand, and Australia lie in relation. 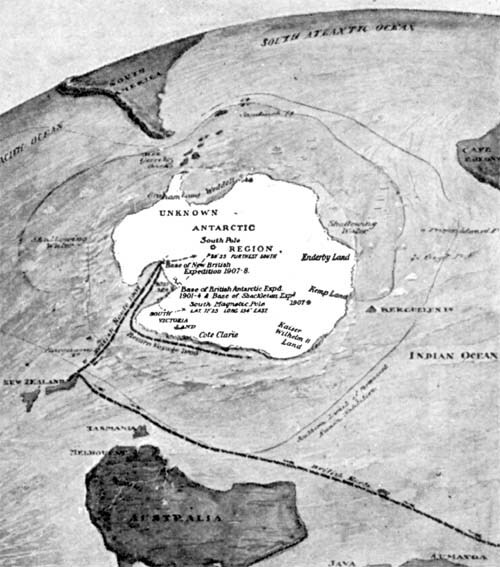 The map's purpose is to show various expeditions to locate the South Pole; the map was reduced such that the labels are almost unreadable even in the original. From the multivolume The Book of History, 1890s.